The world around us has many clever and subtle ways of going after false gods. One of the most prevalent in our modern world is consumerism. Feeling a bit down? Shopping will cheer you up! You don’t even have to leave the comfort of your own home, just click a button and what you want will be sent to you. But it is a transitory pleasure, it doesn’t last. As Christians we know that our source of true happiness and joy is to be found in God alone. This is something which our readings this morning make very clear. The prophet Jeremiah shows the difference between trusting in humanity, and trusting in God. Where we put our trust matters, because it shapes who and what we are. Against a model which stresses human self-sufficiency, we see that reliance upon God leads to human flourishing, having life in all its fulness. Our death is something which we all need to face. Each and every one of us will die, it is inescapable. But because of who Christ is, and what He has done, we do not need to be afraid. The heart of our faith is that Christ died for us, to take away our sins, and was raised from the dead, to give us the hope of eternal life in Him. If it is not true, then the church is a sham, we’ve been fed lies for two thousand years. It would be the greatest deception of humanity ever, we would be truly pitiable. But it is true, and Christ’s Death and Resurrection have in fact changed everything. We have the hope that those who are in Christ share in His Death and Resurrection through their baptism. For us life is changed and not ended, and we have the hope of being united with God in Heaven, which we prepare for here on earth. This is what lies behind the account in Luke’s Gospel. People come from all over the place, from far and wide, to be healed by Jesus. This is what God is all about, the healing of humanity, taking away our fears, our troubles, and giving us the peace ‘which passeth all understanding’. God’s love is made manifest in the healing miracles of Jesus Christ because it represents life in all its fulness. We are loved, healed and reconciled by God, so that we can live in a new way — living the life of the Kingdom, the life of Heaven, here and now. To be poor in the world’s eyes is to lack money, possessions, power, and influence. All these worldly things don’t matter in the grand scheme of things. We have God, and are filled with his love, and that’s what really matters. God satisfies our hunger, or as St Augustine put it, ‘You have made us for yourself, and our hearts are restless until they find their rest in You.’ (Confessions 1.1.8) We have the source of everlasting Joy in God. But being a Christian won’t make us popular in the eyes of the world, quite the opposite. We will be seen as strange, dismissed as hypocrites, because we don’t buy into the emptiness of the world around us. At its heart Christianity looks dangerous and suspect to the world around us, and so it should. We are not conformed to the ways of the world, but rather to the will of God. We don’t just go along with things, because that’s what everyone does, instead we follow a higher authority. We cannot be bought off with baubles and trinkets, with wealth or power, things of this world, because we acknowledge something, someone greater, namely God. We live as God wants us to live, acknowledging Him before all things. There’s something strange and different about us, because we are not like other people. It’s not easy being like this, in fact it’s difficult, very difficult, and it’s why we, as Christians need to support each other in living out our faith together, as a community of faith. Christians face persecution around the world, people are forbidden to convert to Christianity, they are not free to meet and worship, and risk beatings torture, imprisonment, and even death for doing so. It’s real and it is happening around the world as we speak. Here in this country we are more likely to face indifference, someone might say, ‘Why do you believe in all that claptrap? Christians are just a bunch of hypocrites’. Our faith is not nonsense, but rather profound, meaningful, and wonderful. We do, however, need to live it out in our lives. It needs to make a difference to who and what we are, so that others might see the truth of the Gospel lived out in our lives. What we do here in church prepares and nourishes us to love our neighbour. We hear God’s word, and are nourished by it. We pray together for the Church and the World, and those in need. Above all, we are nourished by Christ, with Christ, with His Body and Blood, so that He may transform us more and more into His likeness. 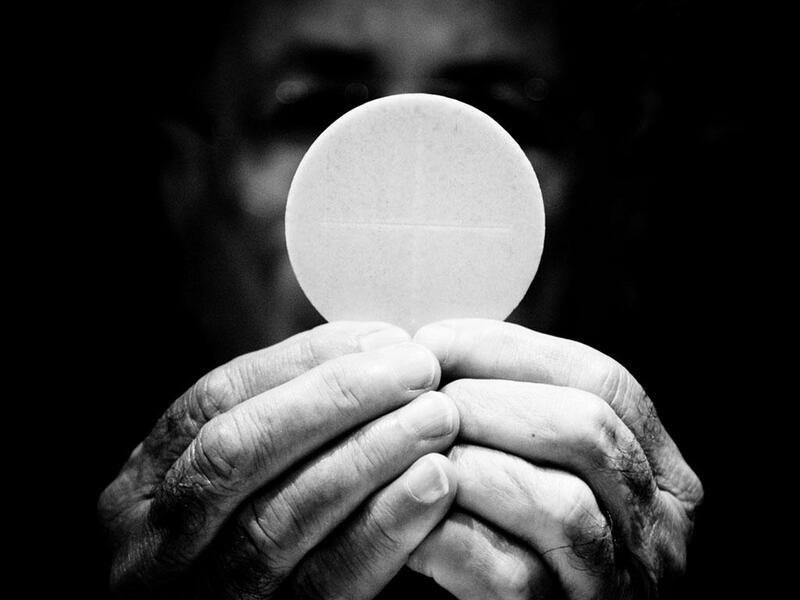 The Eucharist makes the Church, it is the source and summit of our life together. Through it we are united with each other and with Christ in this, the sacred banquet of the Kingdom of God. This is the medicine for which our souls cry out, so that they may be healed by Christ and prepared to live out our faith in Christ’s Death and Resurrection in the world, putting our trust in God, so that He might be at work in and through us, sharing His love with a world which longs for it. So let us prepare to rely upon God, filled with His Joy and Love, sharing it with others so that they may come to believe and give glory to God the Father, God the Son, and God the Holy Spirit, to whom be ascribed as is most right and just, all might, majesty, glory dominion and power, now and forever. Amen. I was somewhat troubled when I first read this morning’s Gospel. I find it all too easy to moan about all sorts of things, it is a very human failing, one to which we all, from time to time, succumb. But it’s something which Our Lord tells us not to do, and so I pray that through God’s grace I may live a life which more closely imitates Jesus, and follows His commands. It reminds me of a passage in the sermons of St Augustine, Bishop of Hippo and Doctor of the Church: ‘“You all say, ‘The times are troubled, the times are hard, the times are wretched.’ Live good lives and you will change the times. By living good lives you will change the times and have nothing to grumble about.”’ (Sermo 311.8) It reminds us that the work of the Gospel is at one level up to us, the Body of Christ, His Church. We have to live our faith out in our lives (as fine words butter no parsnips) and we have to live the change we want to see in the world. Christianity is a way of life, a way mocked and scorned by the world around us, written off as irrelevant, and yet close to the God who loves us and saves us. In the Old Testament reading this morning we see the prophet Elijah being fed, we see God providing food which gives strength, strength for the journey. It prefigures the Eucharist, it looks forward to the reason why we are here today: to be fed by God. We can have the strength for our journey of faith, and the hope of eternal life. In the letter to the Ephesians we see that as children of God, loved by God, we are to imitate him, after the pattern of Christ, who offered himself, who was a sacrifice who has restored our relationship with God. 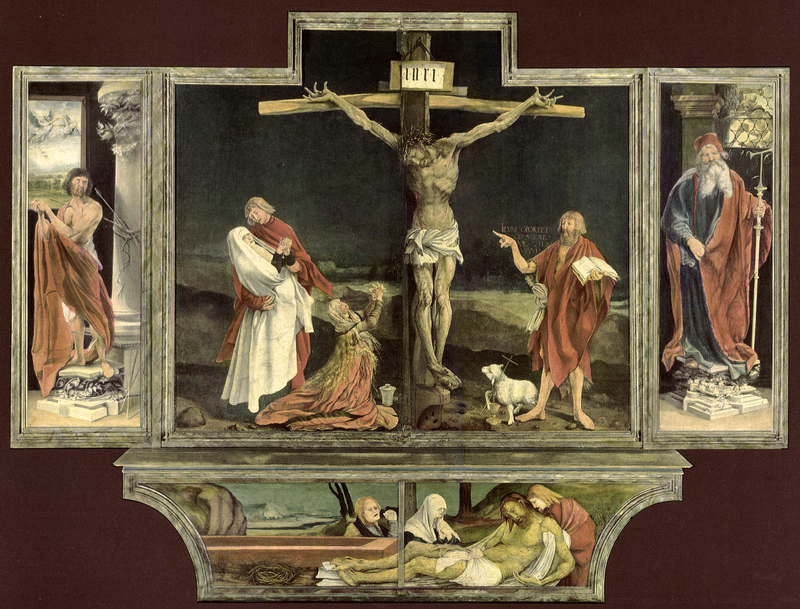 It is this sacrifice, the sacrifice of Calvary, which has restored our relationship with God, which will be re-presented, made present here today, that you can touch and taste, that you can know how much God loves you; that you can be strengthened and given the hope of eternal life in Christ – that God’s grace can transform your human nature so that you come to share in the Divine Nature forever. Paul’s hope for the church in Ephesus should be ours to. This is how are supposed to live together as a Christian community, living in love, fed with love itself, here in the Eucharist, where we thank God for His love of us. In this morning’s Gospel we see Jews complaining, ‘how can he be from Heaven, from God, we know his Mum and Dad’. It is a difficult thing to understand, especially before Jesus suffers and dies, and rises again. It can be hard to understand who and what Jesus is. The Jews can see him only in purely human terms, they cannot see beyond this, the Messiah whom they long for is in their midst and they fail to recognise him. The notion of consuming human flesh and blood is so abhorrent to Jews that it would represent something sinful and polluting. Jesus’ answer is simple and challenging: stop complaining. We are to accept, we are not to moan, to complain, but instead to trust him who is the Way, the Truth, and the Life. We can have such a hope because Jesus gives himself, to suffer and die, and rose again, for love of us. It is this life of love and sacrifice which we are to imitate. Jesus gives himself to us for the life of the world – it is through being fed by him that the world can truly live. It is in experiencing God’s self-giving love that the world can find true meaning. Life in Christ is what true life means. Fed by him, strengthened by him, to imitate him and live out lives of self-giving love, to draw others closer to Christ so that the world may believe and give glory to God the Father, God the Son, and God the Holy Spirit, to whom be ascribed as is most right and just, all might, majesty, glory, dominion, and power, now and forever. Today’s apparently the day which clergy dread, apparently we are petrified of the fact that today the Church celebrates the Triune nature of God, and that being required to preach about it, we might need to know some theology, and explain it to you. Apparently you don’t want this, though I cannot understand why – how could a Christian not want to deepen their faith and their understanding? 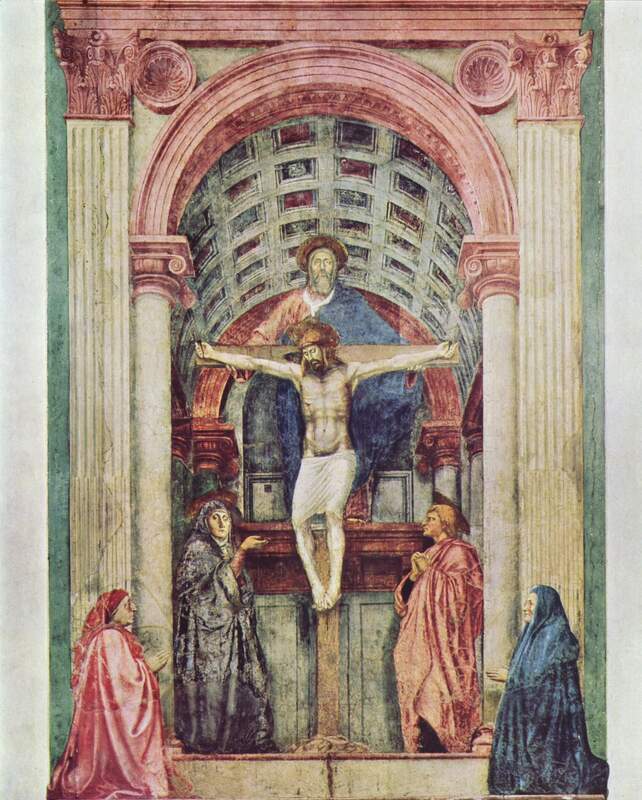 At one level the Trinity could be seen as baffling: Father, Son, and Holy Spirit, three persons and one God, not three Gods, but a trinity of persons, co-equal, co-eternal, consubstantial. Yet what the Church celebrates today is not something abstract but something concrete and personal. The Church is a community, the Body of Christ, a fellowship of the baptised, who are loved, redeemed, and sanctified, by Father, Son, and Holy Spirit. We like to think of ourselves as loveable, as fairly good, decent, well-meaning people, but by divine standards we fail to come up to the mark, we’re not good enough, and all our efforts cannot make us get to heaven, such us the power of sin, of the human condition, and yet by the will of the Father, and through the overshadowing of the Holy Spirit, Our Lord and Saviour Jesus Christ became incarnate for our sake, and was born of the Blessed Virgin Mary, he showed us that God was not an angry, vengeful deity, but a loving Father who longs to welcome his prodigal children. God loves us not because we are loveable, that’s sin for you, but rather so that in being loved we might become loveable, so that God’s grace might transform our human nature, and prepare us for eternity with God. Along the way we will fail, again and again, we will get on each other’s nerves, but if we seek, give and receive forgiveness, then we can allow God’s redeeming love and forgiveness to be at work in us: ‘love to the loveless shown that they might lovely be, oh who am I that for my sake my Lord should take frail flesh and die’. Jesus Christ proclaimed the Good News of God’s love, which some accepted, many rejected, he was crucified to show us just how much God loves us, wretched sinful humanity, he sends his Spirit on the Church at Pentecost to strengthen it, to give it life, to live for God, and in God. We do not deserve it, I certainly don’t, the fact that I have been ordained does not make me a better Christian, I don’t have a hotline to the Divine, I can’t ‘have a word with the Man upstairs about the weather’, it just doesn’t work like that: all I know is that I am a wretched sinner who needs God’s love and mercy, every moment of every day. Thankfully, through the comfort of prayer, Holy Scripture, and the Sacraments of the Church, we can be built up in love – that’s how God works – we are not left comfortless, or without help or guidance, but like any loving relationship it cannot be one-sided, we have a part to play, which begins with our recognising our need for God, and for his love to be at work in us, to seek his forgiveness, and to be loving and forgiving to others, where we stay close to the channels of Divine Grace, so that our lives may be filled with them, so that they can transform our nature. It is an ongoing project, the work of a lifetime and beyond, which starts with humility, develops through obedience, and flourishes in charity. ‘For God so loved the world, that he gave his only Son, that whoever believes in him should not perish but have eternal life. For God did not send his Son into the world to condemn the world, but in order that the world might be saved through him.’ John 3:16-17 (ESV) These few words spoken by Jesus to Nicodemus in John’s Gospel encapsulate what we believe as Christians, and why we believe it, may we live them, strengthened through prayer, our study of the Bible, nourished by Our Lord’s Body and Blood, forgiven and forgiving, preparing to be caught up forever in the love of the consubstantial and coeternal Trinity, God the Father, God the Son and God the Holy Spirit, to who be ascribed as is most right and just, all might, majesty, glory, dominion, and power, now and forever. The prophet Ezekiel has a vision (in Chapter 36) of a messianic future, of the restoration of Israel, which is found in his Son, Jesus Christ and the Church, we are those sprinkled with the clean water of baptism, who have been cleansed. God gives us a new heart and puts his Spirit within us, just as he did on the day of Pentecost, so we are to live as the people of God, lled with his love, and forgiveness, and proclaiming his Truth to the world. This Sunday in the Gospel we are in the middle of Jesus’ High Priestly Prayer, which is the summit of his teaching just before his arrest and Passion. Christ has made God’s name known to us, we know him in a diﬀerent way, we pray to him as ‘Father’ and we are his, we are not our own, despite the Western Liberal infatuation with personal freedom, we are God’s, which aﬀects who we are, and what we do. Christ speaks to us, and teaches us so that our joy may be complete in him, lled with his love, and the Holy Spirit. The world’s reaction to this is a negative one: because what we are, what we stand for, and how we live as Christians is to be opposed to what the world around us stands for – selshness, greed, which it makes into false gods, as though material wealth, or power, or status could save us – such things are transient and ﬂeeting. It oﬀers us a short-cut, an easy road, whereas if we are following Christ, then we are walking the way of his Passion, we are walking the Way of the Cross, dying daily to sin, and letting God’s grace be at work in and through us. It is not easy, it is diﬃcult, most of us are unable to manage on our own, we need the love and support of the Christian community to help us, even the rst Christians, those who had been with Jesus, needed each 0ther’s help and support, so they can continue what Jesus started. We need to be together, to meet together to pray for our needs and those of the world, and to be nourished by the word of God, the Bible, and the Sacrament of Our Lord’s Body and Blood, not because they’re something nice to do on a Sunday morning: an add-on, an optional extra that we can opt into and out of as we feel like, but because as Christians they are crucial to who and what we are, if we are to remain in the love of God then we have to live this way. Only then can we oﬀer the world an alternative to the ways of selshness and sin. It will hate us for doing this, it will despise us, it will call us hypocrites when we fail to live up to the example of Jesus, but as Christians who live in the love of God we forgive each other our trespasses, so that we can live out that same radical love and forgiveness which sees Jesus die upon the Cross for love of us and all the world. It is a message of such love, such forgiveness that the world cannot or does not want to understand it, we may not understand it, but we know that it can be experienced, and we are living testimony to its power. It turns our lives around and sets us free to live for God and to proclaim his saving truth in our words and actions, calling the world to repentance, to turn to Christ, and to be renewed in and through Him. So as we wait with the Apostles for the gift of the Holy Spirit let us pray that God may be at work in us, building us up, and giving us strength to live his life and to proclaim his truth, to oﬀer the world that which it most earnestly desires, a peace, a joy and a freedom which pass human understanding, and the gift of eternal life in Christ.